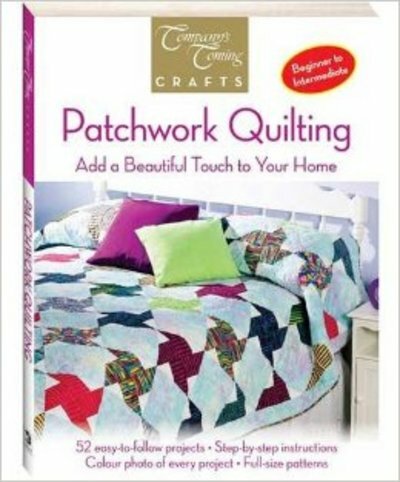 I had always wanted to get into patchwork quilting but I didn’t quite know where to start. I picked this book up from my local bookshop about two years ago. The cover caught my attention straight away and when I looked inside, I was awe struck at all the beautiful creations. I quickly thought I could never get to a standard like that, but this book is great in that it teaches you in step-by-step format of how to begin. As it says on the cover, it is aimed for beginners to intermediate skill level. There are 52 projects included which I can assure you it will keep you busy and each one is fun to make. The only problem you will have is deciding which project to begin with as they are all so beautiful. The book includes patterns for bed quilts, throws, wall quilts, table toppers, baby quilts and gifts. It would be a beautiful book to receive as a gift, especially coming up to Christmas we all need gift ideas and I for one am going to start giving more gifts like this! Have you started your Christmas crafts yet? Are you a fan of documentaries?